Our final day, as organized entirely by Canada Rail Vacations - bye bye Rocky Mountains! Also this 6th day got organized excellent! 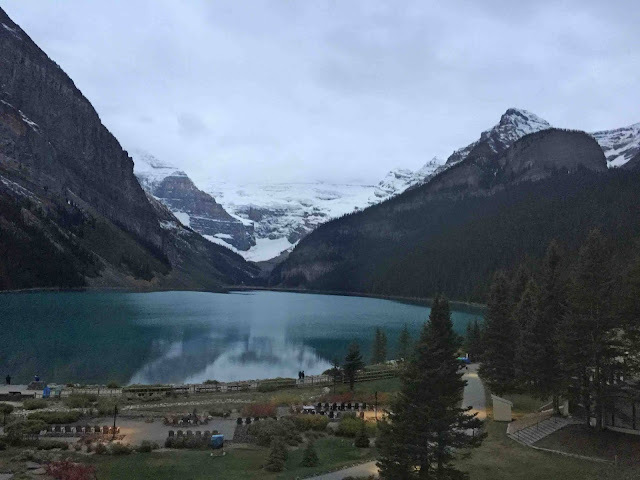 This photo I've taken from our room 237 at Fairmont Chateau Lake Louise at 7:29 in the morning. Not quite daylight... but later that morning I felt so good for having captured this as it was rainy and rather cloudy! The Victoria Glacier in the center is visible here. View to the left... with still the Victoria Glacier visible to the right. View to the right with the Painter Wing of the hotel visible. This was the early morning view from above... Finding Pieter's iPhone. It is a huge hotel, with the Glacier Wing to the right of our Barrott Wing as well as the newest Mount Temple Wing. We both felt like having half a day vacation so we stayed in and went for brunch at the POPPY BRASSERIE. That was quite a treat and we felt pampered for not having to rush! Check out at 1:00 PM and we had to wait still till 2:00 PM till the Brewster Express came to pick us up and brought us to Banff from where we left on a big Brewster Sightseeing bus to Calgary Airport. Constantly when the big double doors in the parkade or big entrance went open you got treated by very cold air. Also the previous night, when we dined in the entirely open Lakeview Lounge with spectacular view but very drafty entrance around the corner. They should learn from the Alpine style double vestibule. So, avoiding all that draft, we went to the Lower Level of Mount Temple Wing, where no doors opened. Trails can also be made of steel. 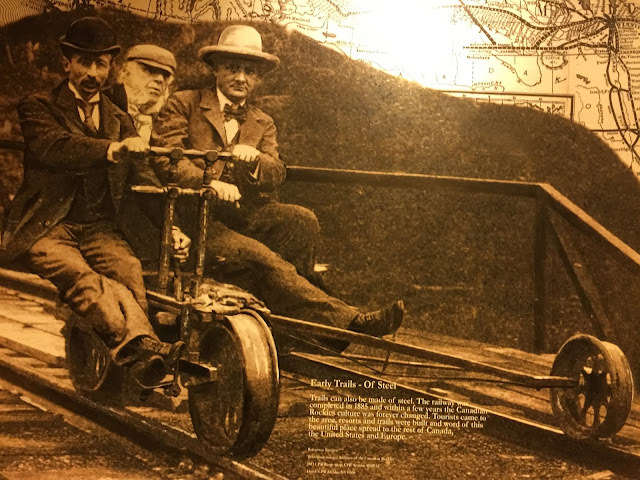 The railway was completed in 1885 and within a few years the Canadian Rockies culture was forever changed. Tourists came to the area, resorts and trails were built and word of this beautiful place spread to the rest of Canada, the United States and Europe. Princess Louise Duchess of Argyll, G.B.E., was the eldest daughter of Queen Victoria, The Princess was born March 18, 1848 and lived until 1939. The highlighted eldest daughter of Queen Victoria is WRONG! Princess Louise was the Queen's 4th daughter. On September 13, blogger friend Debbie did write a blogpost about her: Princess Louise, Duchess Of Argyll and it is quite interesting to read, just click the hyperlink. For both of us it was great information about the very hotel, named after her, we soon were going to stay on our trip through the Rocky Mountains. But surprising to see that at the hotel they got it WRONG! Hoping to be able to once check it out in person...! Yay! Today, December 28, received an update about the correction on this. 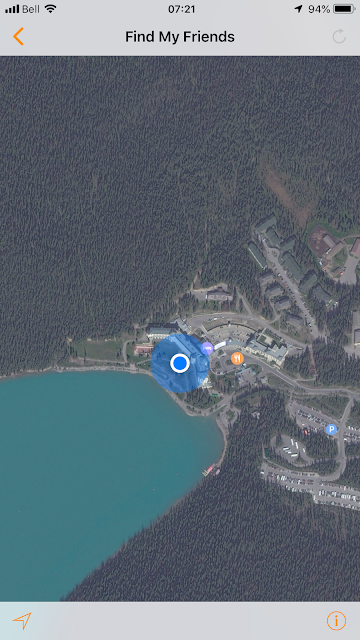 Have to say that Fairmont Chateau Lake Louise provides the highest courtesy in every way! 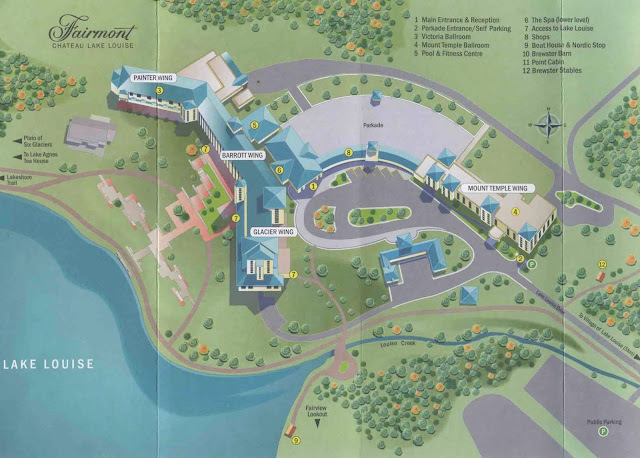 We'd booked us a room at Delta Hotels by Marriott, at the Calgary Airport. One only needs to cross the road for entering the airport terminal - very convenient! 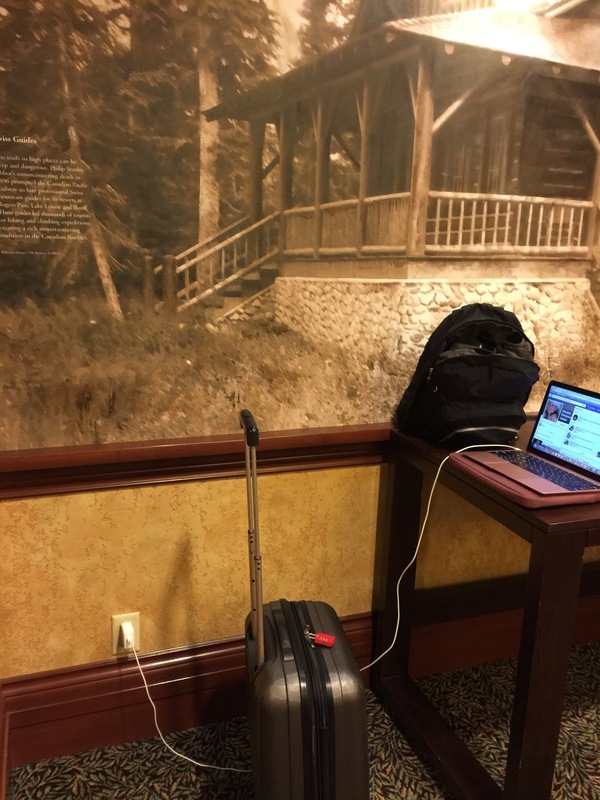 No photos made during the trip, except our Relive video of 1 min. 44 sec. The next morning we got up early and it was cold! Departing from Calgary International airport was a breeze. Clearing through US Customs and through Security Check went fast! Thanks again for your visit and comment! Lake Louis, what a wonderful place! Thank you for sharing all those great pictures and your story! It is an almost magical place right in these Canadian Rocky Mountain Parks that are a UNESCO World Heritage site. So blessed for having toured there and seen it all. ich freue mich über deinen interessanten Post. Hello Mariette, The mistake about Princess Louise shows how careful you have to be when researching the past--you have to double-check everything. Still, I would have been fascinated by all the historic photos of the region. Yes, anything you put in writing you better double check! We loved all those old photos, so much history from 1885 till now about these beautiful National Parks. 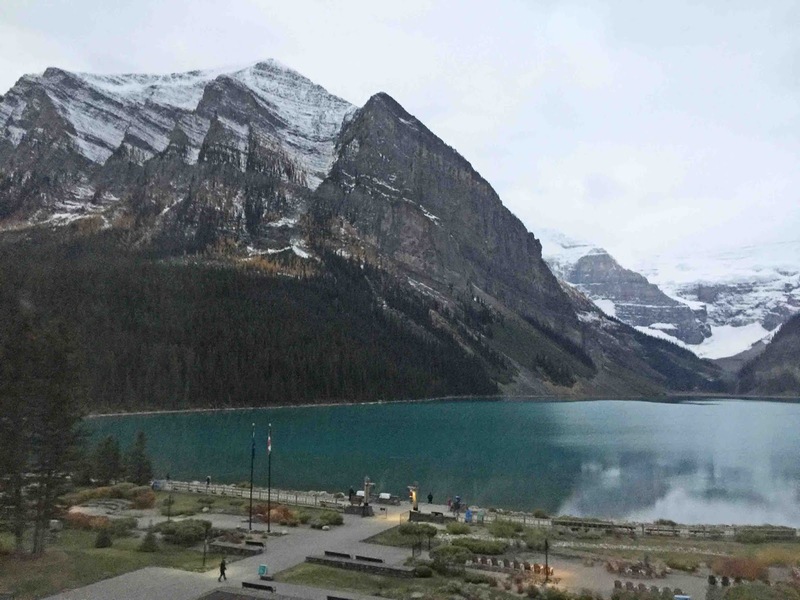 Dear Mariette - that was both an impressive and magnificent view you had from your room at Fairmont Chateau Lake Louise. 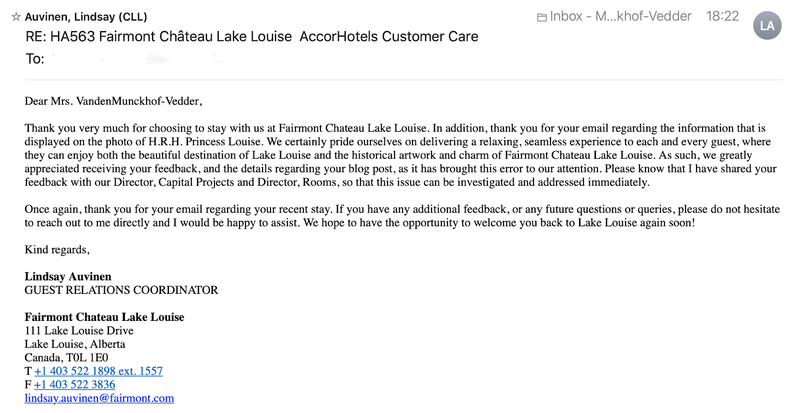 Did you tell the hotel about the mistake that they had made? If so, I wonder if they have bothered to do anything about it! It was quite impressive indeed, from our room far better than form the ground. For that reason I've waited longer here to reply! Looks like the younger people don't really care about history and the accuracy of certain facts. Both of us are really history buffs and love to read and educate on the subject before traveling any place. Yes, indeed, it was so far the best vacation ever! I've also enjoyed it so much because there was no driving for me involved... as usual is the case. This is a huge hotel indeed and has such a breathtaking view! I think double vestibule would be a great idea especially when it's so cold outside! Well, the Manager of the Lakeview Lounge did reply: "We have recently turned off the automatic doors so that they do not stay open for a period of time. We apologize that the draft of cold air made for an unpleasant dining experience". So glad they have done something about it as it sure was unpleasant. 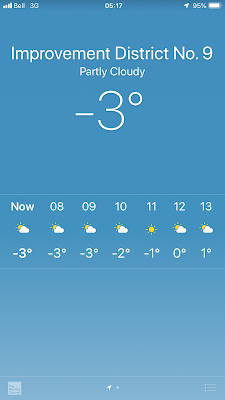 The view is breathtaking as long as you're in the comfort of your room or dressed warmly outside. The first images are very beautiful. I love very much ! You had a great time, it's great. Thank you, we enjoyed being in these National Parks in the Canadian Rocky Mountains, a UNESCO World Heritage Site as well. So happy for nature to be kept pristine over these years since 1885. Nice photos of your trip Mariette. 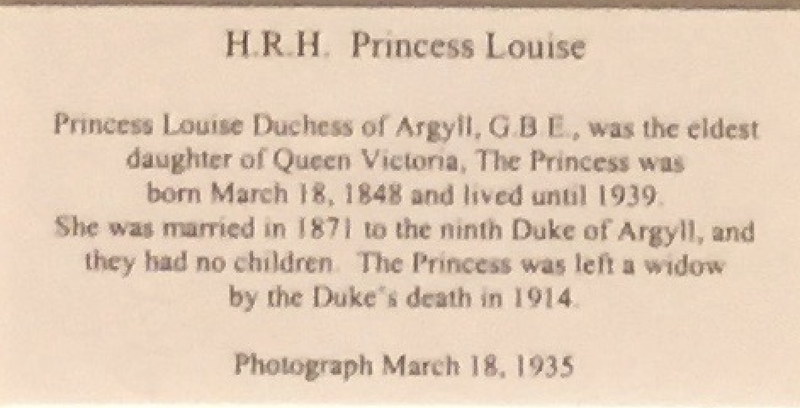 Strange that the hotel got their facts wrong about Princess Louise. Thank you, even with the weather rather dark, we tried to capture it. Yes, one wonders how one can put something in print that is NOT true! What a beautiful place,and the view from the lake and the mountains is breathtaking! Wonderful pictures from your trip! 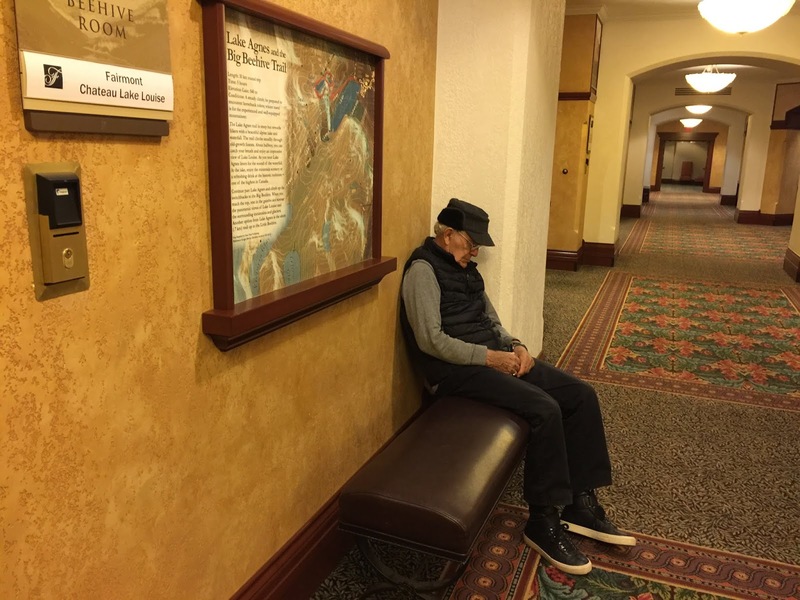 I’m sure you had a great time visiting Lake Louise! Thank you for sharing! Wishing you a lovely day! Hugs! Yes, we felt like being in nature's paradise. So pure and peaceful also. The photos could have been far better but we only had limited time and could not wait for better weather. What an interesting trip you took to a beautiful area of Canada. I hope the Canadians are able to keep their clean, beautiful landscape always and never overdevelop it. 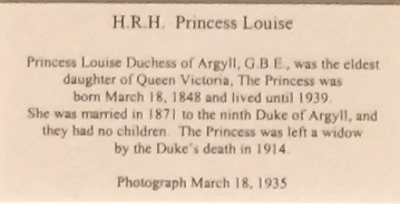 Thank you for linking back to my blog about Princess Louise and her husband, John Campbell, who did quite a bit as Governor-General of Canada. Isn't it a wonder how a rememberance of a historican person is gotten wrong? How is it that no one fact-checks. And why note their childlessness? That is a mystery, as opposed to using the space to list what all they accomplished for Canada. Oh well, is my love of history making me nit-pick? Thanks for sharing your trip. Very interesting, indeed! Thank you for your comment and yes, let's hope they maintain this UNESCO World Heritage site in the Canadian Rockies the way it has been preserved. Such wonderful National Parks and the entire world comes here to admire it. 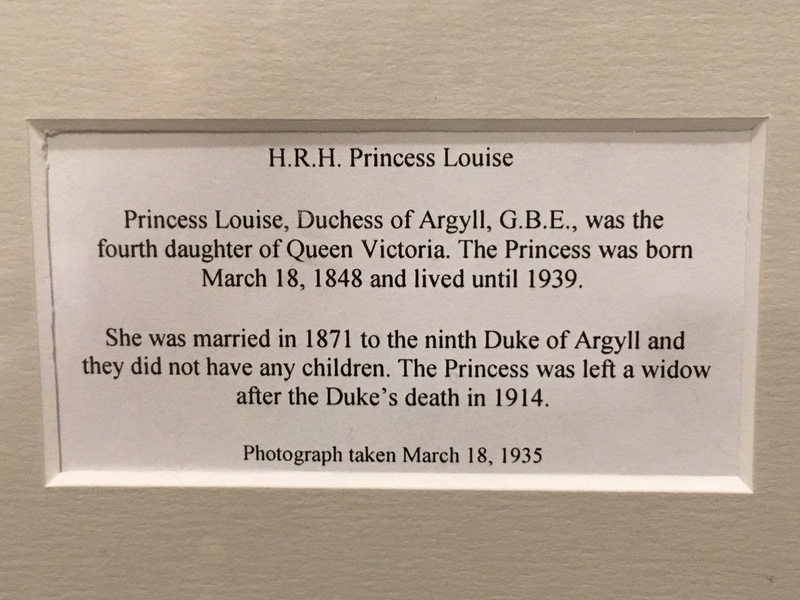 Nothing is mentioned of Princess Louise's husband being the Governor-General of Canada. You and both of us do love history and we always do fact-check as well. It is obvious that a lot of people don't respect history's grand people and even ignore all of their accomplishments, worse still getting the facts wrong! 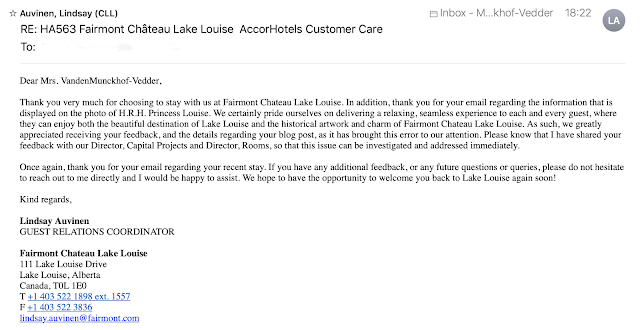 Nobody ever bothered to reply to my writing about it - to the Fairmont Chateau Lake Louise that is. I enjoyed seeing your photos of your trip and you were lucky to get an early morning photo of the lake before the rain and cloud came. 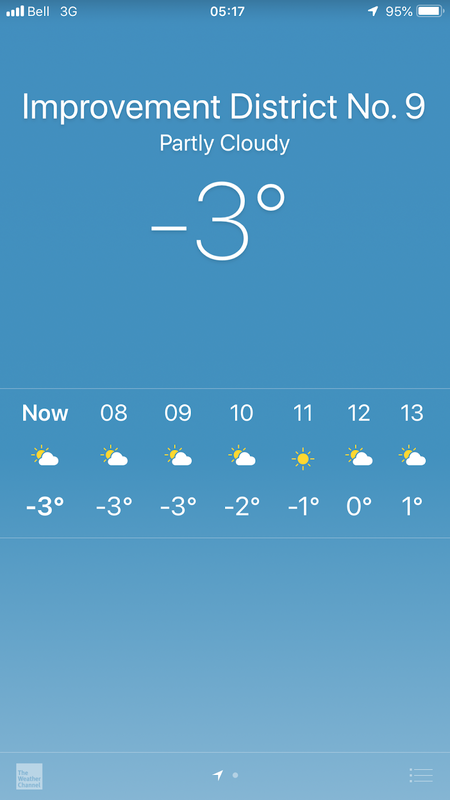 Shame that it was cold and drafty though. They seem to have addressed the draftiness though by turning off the automatic doors so they no longer remain open for a period of time. We did enjoy a lovely brunch the final day, downstairs in a cozy area! 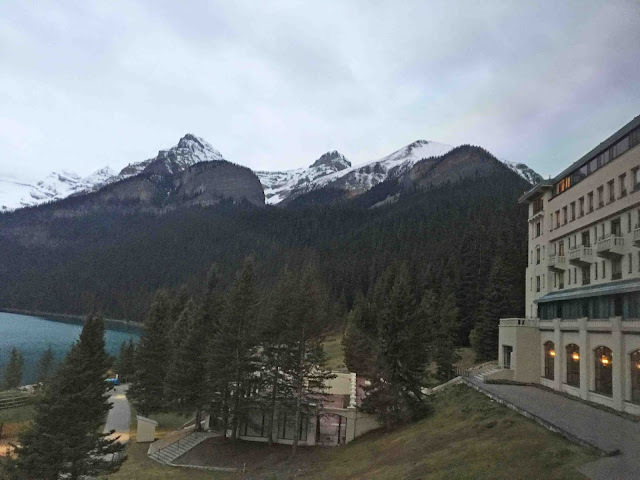 We stayed at the Chateau at Lake Louise and The Banff Springs last Fall. Amazing that you found that error! Happy for you for having been there as well last fall. Well, I've been always a fast reader and I do have a sharp memory once I've read something and I spotted this error right away and captured it. They don't seem to bother as they did not reply to my writings. Estas são as paisagens que eu gosto. Prefiro as montanhas, lagos, em primeiro, depois praias e mares. 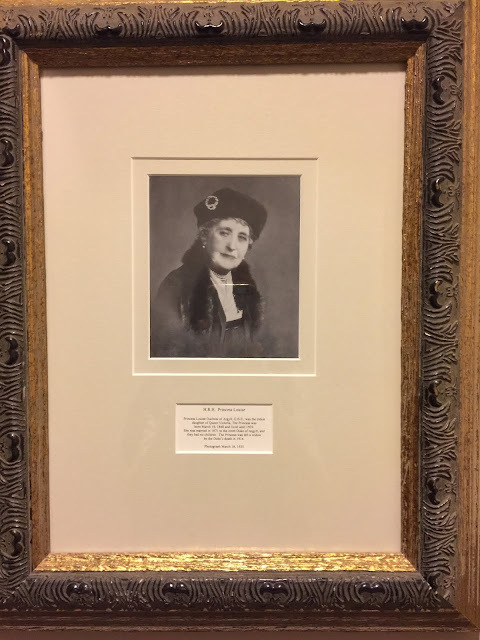 O Lake Louise é belíssimo e gostei de ver a foto a princesa Louise. Ambos nós também preferimos montanhas, lagos e natureza em geral acima das praias! A história é sempre interessante aprender sobre e o marido da princesa significou tanto para esta área. Amei o lugar. Linda montanha. Um bela vista de sua janela. Foram ferias maravilhosas. Obrigada por compartilhar tantas belezas. The inclined strata on the mountain are very beautiful. They tell us the great force of the earth. Happy sunday to you. Thanks for your visit and comment. MARIETTE'S BACK TO BASICS © 2009. All rights reserved - Text and images may not be copied for distribution or sale. Thank you so much for following! Gaat (extreem) geweld ook ons straatbeeld bepalen in de aanloop naar de EU verkiezingen zoals in de VS? Nieuwe planten van plantenmarkt Kalmthout..
Why Are You Seeing Enamelware Everywhere? Un buen y grato saludo! Shabby Chic Con Amore - Casa Shabby Chic.